The Greater Spotted Eagle (Aquila clanga), occasionally just called the spotted eagle, is a large bird of prey. Like all typical eagles, it belongs to the family Accipitridae. The typical eagles are often united with the buteos (Buteo), sea eagles (Haliaetus) and other more heaviset Accipitridae, but it appears as if they are less distinct from the more slender accipitrine hawks than believed. It is 59–71 cm (23–28 in) in length and has a wingspan of 157–179 cm (5.15–5.87 ft) and a typical body mass of 1.6–2.5 kg (3.5–5.5 lb), with an occasional big female weighing up to 3.2 kg (7.1 lb). This medium-sized eagle is very similar in general appearance to its closest relative the Lesser Spotted Eagle (A. pomarina), which shares part of its range. 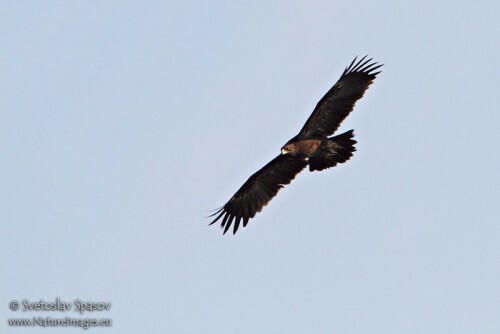 Head and wing coverts are very dark brown and contrast with the generally medium brown plumage; the Lesser Spotted Eagle has a paler head and wing coverts. The head is small for an eagle. The similarities of the Greater Spotted to the Lesser Spotted often results in misidentification as being that species. This is further complicated by occasional hybrids between the two species. There is often a less obvious white patch on the upperwings, but a light crescent on the primary remiges is a good field mark. The white V mark on the rump is less clear-cut in adults than in the Lesser Spotted Eagle. The juvenile has white spots all over its wings and lacks a lighter nape patch. In winter, it occurs in the range of the Indian Spotted Eagle (A. hastata). From this recently-validated relative, it can be distinguished by the darker color and lighter eye (not darker than the body plumage at distance, lighter at close range), and in juveniles, the strong spotting. It is also a bit larger – though this cannot be reliably estimated in the field – and in the winter quarters prefers wetland habitat. The Lesser Spotted Eagle (A. pomarina) is this species' closest living relative; their common ancestor seems to have diverged around the middle Pliocene, perhaps some 3.6 million years ago (mya), from the ancestors of the Indian Spotted Eagle (A. hastata) that lives across Iran, Pakistan and India. The "proto-Spotted Eagle" probably lived in the general region of Afghanistan, being split into a northern and a southern lineage when both glaciers and deserts advanced in Central Asia as the last ice age began. The northern lineage subsequently separated into the eastern (Greater) and western (Lesser) species of today, probably around the Pliocene-Pleistocene boundary not quite 2 mya. The spotted eagles as a group are quite distinct from the typical members of Aquila, the "true eagles". They will probably be included with their putative tropical relatives in Lophaetus or Ictinaetus, or moved to a genus of their own in the near future. This is a species of fairly wooded country, which hunts small mammals and similar, mainly terrestrial prey. It breeds from northern Europe across Asia, and winters in southeastern Europe, the Middle East and South Asia. Migration to breeding grounds takes place fairly late; in Bhutan for example birds can be seen with some regularity until the end of March . This eagle lays 1-3 eggs in a tree nest. Generally territorial, juveniles spend some time with their parents after fledging, until they reach sexual maturity and seek out a territory and a mate of their own. In winter quarters, the species is more social. Small flocks of up to ten birds or so, of varying age, can be seen to patrol the land together. They also associate with other Accipitridae in winter quarters, like local and/or migrant Black Kites (Milvus migrans lineatus and govinda) or Steppe Eagles (A. nipalensis), distinctly smaller and larger raptors, respectively. This species is prone to vagrancy. Its regular breeding range does not reach to Germany anymore these days, but still they are not rarely met with in that country, with a few birds seen every decade. Even young birds disperse widely; the Staatliches Museum für Tierkunde Dresden has a specimen (C 21845) shot in November 1914 at Großgrabe near Bernsdorf in Saxony. It is a juvenile, and though its exact age cannot be determined it is heavily spotted and probably less than 20 months old. An adult Greater Spotted was tagged with a satellite transponder in 1993 in order to track migration. The tagged eagle migrated a total of 5,526 kilometers (3,434 mi) from its wintering grounds in Yemen to it breeding grounds in western Siberia. It moved 150 km (93 mi) on average each day, but this increased to 280 km (170 mi) per day as the bird flew through Mesopotamia.